Mayor Rahm Emanuel announced that in just nine months of operations, Chicagoans and visitors have taken more than one million individual trips on Divvy, Chicago’s bike share system, passing the milestone on Tuesday. To celebrate the warm weather and bicycling, Mayor Rahm Emanuel has designated April 21-27, 2014 to be “Divvy Week.” During week, Chicago is celebrating its newest transit system with special promotions and activities designed to encourage residents and visitors to give Divvy a try or to become annual members. 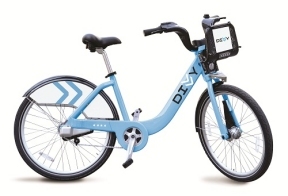 Divvy Week is the perfect time to try Divvy Bikes for the first time as daily passes, regularly $7, will be available for just $5. Riders can use a credit or debit card to activate a 24-hour pass at any Divvy kiosk. Divvy Ambassadors will be standing at popular Divvy stations during the week handing out Divvy stickers and answering questions about the system. Follow the Divvy Week festivities on Facebook, Twitter, and Instagram to make sure you don’t miss any of the surprises Divvy has in store. Snap a selfie from your adventures around the city on your Divvy Bike and upload them using the hashtag #DIVVYWEEK.